While investigating the murder of a Gothamite, Batman identifies his prime suspect as Lamont Cranston...but there are two problems with that. One, Batman is not aware of Lamont's alter ego as the master detective known as the Shadow. Two, and more importantly, Cranston seems to have died over half a century ago! The Shadow was a major influence of the Batman himself and now appears in this incredible six-issue miniseries. 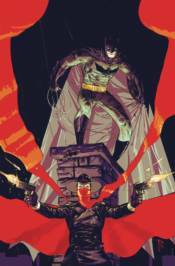 Collects BATMAN/THE SHADOW #1-6 and a story from BATMAN ANNUAL #1.